Rouvalis Flowers - Boston Florist, Flower Delivery, Corporate Floral, Flower Subscriptions, Plants & Garden Design BlogDaffodil modern art garden in Seaport will honor Boston Marathon. Daffodil modern art garden in Seaport will honor Boston Marathon. 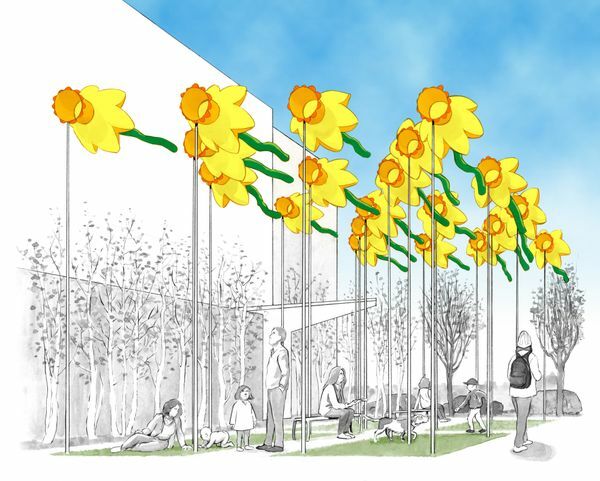 If the gardens bloom late this spring, those in the Boston can rest easy: Towering daffodils will arrive on the Seaport Common this spring in the form of a public art installation that pays homage to both the season of renewal and the beloved Boston Marathon tradition. Beginning April 8, a modern art garden called “20 Knots: Daffodils for Boston,” commissioned by Brooklyn-based artist Daniele Frazier, will be on display on the Seaport Common. The artwork pays tribute to the Boston Marathon and consists of 20 colorful, large daffodils that shift shapes with the wind, according to Frazier. The towering flowers will stand 20 feet tall in shades of yellow, orange and green. The artwork is synonymous with an organization founded by Diane Valle in response to the Boston Marathon bombings in 2013. Her project, called Marathon Daffodils, works with nonprofits and horticulturists to place 130,000 daffodils along the marathon route from Hopkinton to Copley Square. The Boston Seaport community has taken part in the Marathon Daffodils’ tradition, displaying the flowers in windows at businesses and restaurants in the neighborhood. The “20 Knots” artwork -- which marks the Seaport’s ninth public art installation -- can be seen on the Seaport Common from April 8 through April 29.